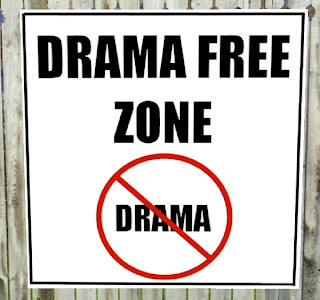 Generally, if I see a sign like this posted in an area, my brain translates it immediaely into "We Know Drama". It's a red flag for folks who have trouble communicating effectively and have poor conflict resolution skills. They're usually generally nice folks, and frequently rather charming and even engaging, especially at first, but things tend to disintegrate after a while, until they predictably explode. Everyone has friends like this. They blunder around, wondering why there is so much drama everywhere. Limp wrist to agonized forehead, they bemoan the problems that they are having with EVERYONE. Apparently EVERYONE is a drama queen, and they will go on and on to some degree about how awful it is, never suspecting that the one thing that EVERYONE has in common is interaction with themselves. The logical converse of "I am having a problem with EVERYONE" is "EVERYONE is having a problem with me." But, lacking insight, they never quite make that leap and go on to assume that "new friends" must be the answer, seeking new, unsuspecting victims, errrr friends. Been wondering why you've been so quiet - think I figured out why - d'oh! Mischief Managed (I think, check IM's). HMM well now I hope I am in the right zone! Heh, this is a good post girl!